Plasma Cutters | R.J. Kates Co. 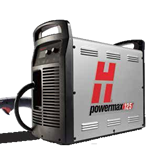 The Hypertherm Powermax 30, a light weight plasma cutter, can handle thicknesses from 1/4″ to a maximum of 1/2″. 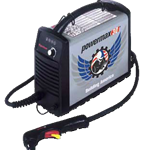 The Hypertherm Powermax 85 is a handheld-mechanized plasma system for cutting or gouging metal from 1″ to 1 1/2″. 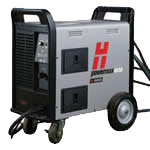 With advanced technologies in both power supply and torch, Hypertherm® G3 products cut faster, and more economically, than most systems available today. 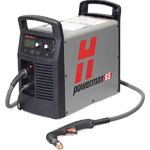 The Hypertherm Powermax 45 is a handheld-mechanized plasma system for cutting or gouging metal from 1/2″ to 1″. 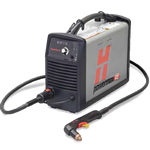 The Hypertherm Powermax 105 is a handheld-mechanized plasma system for cutting or gouging metal from 1 1/4″ to 2″. 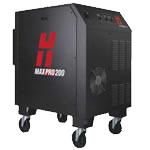 The Hypertherm MaxPro 200 combines fast cutting speeds and quick process changes maximize productivity, allowing the fastest cut speeds in its class. 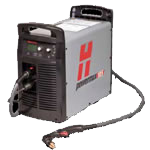 The Hypertherm Powermax 125 is a handheld-mechanized plasma system for cutting or gouging metal from 1 1/2″ to 2 1/4″.